A professional tuneup ensures that your heating equipment runs at maximum efficiency throughout the winter. In addition to preventing unnecessary energy waste, keeping the system well-maintained is essential for its safe operation and can help avert a chilling, mid-winter breakdown. 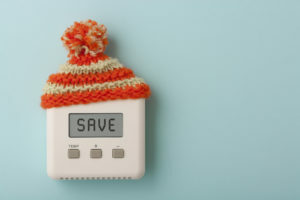 The U.S. Department of Energy (DOE) advises that using your programmable thermostat wisely can reduce your comfort-related energy consumption by as much as 10 percent. For optimal savings, program in daily 10–15-degree temperature setback periods of eight hours or more. Leaky, uninsulated ducts can cost you up to 30 percent of your furnace's warm air output. Having the accessible ductwork sealed and wrapped in insulation can curb those losses and help you save money while boosting comfort. Ceiling fans aren't just beneficial in the summer – they can make heating more efficient in the winter because warm air naturally rises. Simply set the blades to spin clockwise and run your fans on low and they'll pull up cooler air from floor level and push warmer air back down into your living space. Heat craves equilibrium, and in the winter, the warmth inside your home naturally tries to migrate toward cooler areas through any available openings. You can limit this heat loss by sealing gaps and cracks around the windows, exterior doors, penetrations through the shell, and the attic access hatch. Cold winter air doesn't hold moisture well, and your home heating system dries it out even more. Humidifying your home can allow you turn down the thermostat to save energy without losing out on comfort. For more advice about saving money while keeping your Fort Wayne-area home comfortably warm this winter, contact us today at Hartman Brothers Heating & Air Conditioning.